I did it again. I’ve neglected my website. My key focus at the moment is balancing my writing with everything else. There is so much more to life than writing, but I do enjoy it. When I create characters and a world of fiction, it gives me a sense of satisfaction to think that somebody might be engrossed in a world of make-believe that came from somewhere in my imagination. People often ask me where I get my ideas from. I don’t have an answer, they just sort of happen. I’ll think of something that will take on an entire life of its own and quite by accident, there’s a fresh new world with interesting characters. At least, I hope they’re interesting. It’s back to it now. I’ve just arrived home from my part-time job and put a load of washing on. Time for me to do some real work! Well to say that time has passed me by would be an understatement. But I really have been busy. I published a new book, the fifth in The Hooper Mysteries series and have been working on the sequel to Scavenger. Not to mention the short story competitions that I am working on entries for. So although this blog is slightly neglected, my writing is still going strong. By the way, writing short stories for competitions is the perfect way to practice. There are several on the internet and some even give you a title. They cost very little to enter and there are competitions that will provide a critique of your writing for a small fee. It’s worth it if you’re serious about your craft. It’s been a few months since I did anything to this website and I feel guilty. Taking a few weeks off to enjoy Christmas and the new year, I’m finally back on track. I’ve just finished the fifth installment of The Hooper Mysteries and it’s due for release at the end of March. As for YouTube, it’s a work in progress, but definitely coming together. So hopefully it won’t be too much longer before I start to share some content. To be honest, it’s a little more difficult than I first anticipated, but something I’m looking forward to accomplishing. The countdown’s on, in a few weeks I’ll be starting the YouTube channel and reading my stories to the world – or whoever tunes in. I’ve been thinking about this for a while and although there are a few questioning thoughts, I’ve decided it’s now or never. It’s sad when you procrastinate and every single day that passes by is another day lost. But the day is coming closer. I had planned a Halloween special, but it came and went and I wasn’t ready. But I’m definitely not waiting until next year. A big thank you to all of those who had actually read my books and left a comment. Every time an eBook gets a rating, it moves up the ranks and gets a little more attention. The YouTube project is well underway and I plan to kick it off on the 31st of the month with a bit of a Halloween special. I’m a bit nervous. It’s one thing to put your work out there, but it’s a completely different story when you decide to go online and read it to people. But I’m hoping for success. Luckily for me, buying sweets for the scariest night of the year means I’m in for a treat. Not many people come knocking on your door when you live on the top floor of a secure building! Thanks to everybody who has supported me in any way. It’s time for me to step it up a notch. There are so many people in the world these days who are time poor and all they want to do is get in at the end of a hard day’s work and relax. So instead of you having to read my books, I’m starting my on YouTube channel and I’ll be reading you a story each week. That means that you can just kick back with a cup of tea and enjoy. So dear reader, watch this space! It’s great when you stumble across something that you’ve based an entire novel on. On a recent trip to Wales, I visited a pop up market and found this triskelle in a stall which sported Celtic jewelry. I had to buy it of course. Well, after plugging my book – The Mystery of Kissing Gate Woods, to the woman at the stall, I took her card. The pendant is made by Celtic Treasure and they have some really nice pieces. Anyway, while I was in Conwy, I did the whole sightseeing thing and visited the tourist attractions within the popular hamlet. If you’re a writer or you’re even thinking of dabbling in a story or two, travel is the best source of information and inspiration. 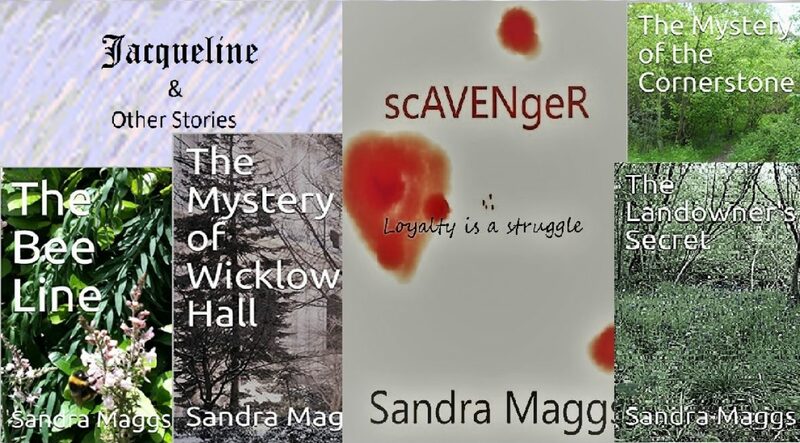 In the space of just a few days, I learnt so much that I can include in The Hooper Mysteries that I’m almost rushing to finish my current book so that I can start five more! When I first decided to start writing seriously, I thought that if I wrote a book and sent it out to loads of publishers surely someone would want to see it in print, boy was I wrong. Just trying to get someone to take you seriously is a hurdle. So after years of rejection, I decided it was time for me to embrace the world of online self publishing. There are millions of eBooks online. This is a fact, and all of the authors who write these books start off like me. They have a dream, a vision of what they want their future to look like. My dream is now a permanent fixture. It won’t move aside or let me stray too from it. It constantly whispers to me reminding me that if I continue to nurture it, it might just come true. Writing, creating, imagining, this is just a small part of what it is to become a success. The majority of my focus at the moment is marketing my books. After reading several online articles by writers who have achieved success, and listening to countless podcasts, it’s begun. An onslaught of messages and emails to friends, family, and even people I don’t know. Because dear reader, it’s all about algorithms. Until recently, these pesky little buggers didn’t even enter my thoughts, but to rise to the top, I need my readers to rate and comment. That’s how it works. I’d rather have fifty 3 star ratings than one 5 star. So if you’ve read any of my work, please be a little generous and rate the eBook. While you’re doing that, I’ll practice patience. I’ve had this website for a couple of weeks now and realised that I hadn’t really written anything more about myself. All I’ve really done is post my books. So let me tell you more about me. On my Smashwords profile page it says that I was born in a library. This isn’t true. I was born in a hospital in Somerset, UK. I wasn’t really fed classic literature either. I ate food, just like everybody else. So now I’ve admitted that I make up stories about myself, you probably won’t believe anything I write. But it makes life just a little more interesting, doesn’t it? Isn’t life just one big story about you? Its amazing you know, everyday life. The amount of inspiration that’s on the other side of the door, well it makes my head spin. For instance, I was walking to work one morning – I start at five. It was dark out and I tend to cut down the alleyways. Anyway, at the end on one of the lanes was a guy wearing a weird sort of balaclava. Most people would turn and walk the other way, but not me. I wanted to know what he was up to, so I continued on my path. I still don’t know what he was doing because I didn’t want to get too close – maybe rolling a cigarette???? Anyway, I started thinking about it and turned the incident into a short story which I’m putting into another collection. It’s the simple things in life that inspire me and hopefully I’ve inspired you to look around and take notice of everything. Perhaps I’ll be reading your books one day. Yes, the most seemingly minor incidents and encounters can be a great source of creative inspiration if we are open. Yes and it’s strange how a random comment on a High School facebook page can rekindle a friendship. It’s a story in itself. Thanks for you comment Lesley. I definitely will.